I’m in the middle of rebuilding a 1957 35 with the 23c engine. 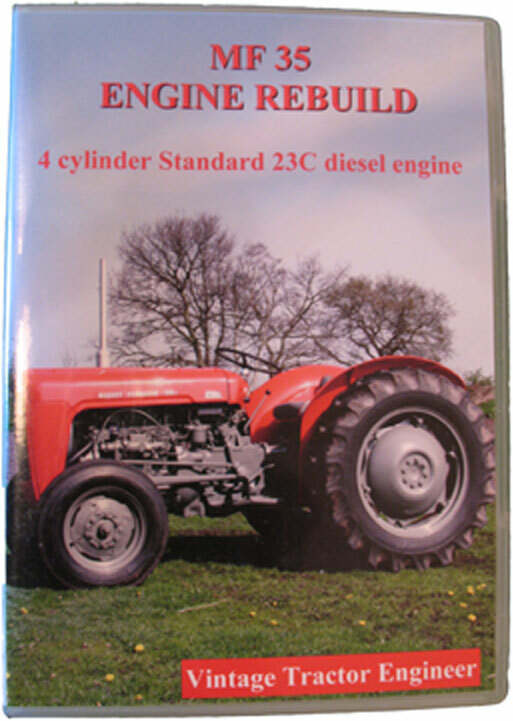 I bought this as a non runner having had a engine rebuid kit fitted the previous owner failed to get the tractor going. After stripping the engine down again I found the trouble to be a ringset that was about half an inch too small had been fitted ( possibly out of a 20c?) any how I have fully rebuilt it from scratch and have used your DVD as a guideline which was most helpful. After this the engine purrs with no smoke and a lovely even tickover but is a swine to start. It takes 20 seconds of heat, try it with no luck, heat again, no luck but usualy on third attempt it will splutter on 2 cylinders then cough into life. I’ve adjusted the pump timing to where it starts the best. Any ideas what I could try next? Have the injectors been serviced? as that is a good place to start. There are 2 jets in the injectors, one is the running jet and the other is more effective during starting. The starting jets have a habbit of getting blocked or at least not working to full efficiency. If they have been serviced, then have you also had the injector pump looked at? Worn injector pumps often do not produce sufficient fuel pressure fast enough under starting conditions. Because the fuel filter element is containeed within a bowl, it is possible to run these engines without a fuel filter fitted. If a previous owner has ever done this then it is more likely that there will be problems with the injector pump hydraulic head. This device has two closely fitting, highly pollished components, which are a fuel tight fit to each other. As you can imagine, the slightest bit of wear can make them leak considerably and hence cause a drop in fuel pressure. When running, if it is timed up correctly then it should sound similar to any Peugeot diesel engine. Only other thing is to make sure there are no sticking valves. You could take the rocker-cover off to check this. I have a MF35 with the 23C four-cylinder diesel engine. While these engines never started easily, this engine is getting particularly hard to start. I have heard that it is possible to fit a different starter motor, which turns the engine over faster than the original starter motor, and ths improves starting. Does anyone know if this is true, and if so, what starter motor can be fitted? We’ve no first hand experience of changing the starter motor, but I’ve heard that the starter from a Ford 5000 fits. Maybee a better avenue to explore would be Sparex – I understand that they used to do a 3kW HD starter to fit the 23C engine. My MF35 Gas tractor will hit but not start. I have checked the fire and gas to the carb. Could this be a bad carb.? Can some one tell what the faster starter is off. My 35 is running like a dream once it gets started. Going back to 1960 (somewhere around that time) when I was around seventeen, I remember we had a 4 cylinder 35 diesel which of course had all the symptoms cataloged here and was an absolute pig. I resorted to retarding the timing of the pump to start it and resetting it when I got it going, it did help but it never was a good engine, it didn’t even come close to the little grey ‘fergie’ TE20 diesel we had before, having said that,the 3 cylinder Perkins engine did fix all that! 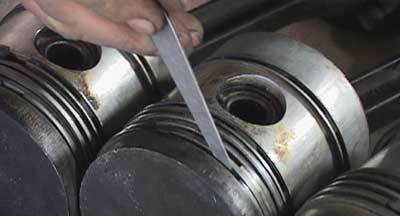 I blamed the early CAV injection(rotary pump)system and the ‘dry’ cylinder liners which wore out in no time. The Simms injector system on the TE20 never gave any trouble at all. Sorry for the negativity :-). Yes it sounds like the timing is incorrect (or at least needs checking). Any timing marks which have been added over the years are insignificant. The ones that are significant are the TDC and BDC markings on the flywheel, flywheel timing pin hole and the ‘G’ mark inside the injection pump. Also the valves need setting. 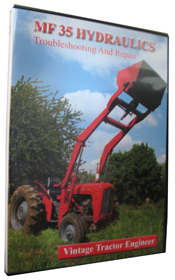 It is such a complex process that really I would suggest either the Engine Rebuild DVD or a manual. Hi, I have a 58 TO35 Standard Diesel that I have had the starter rebuilt 2 times, and now is down again. I was wondering if the starter from a FE35 will fit the TO35. Also as one writer put it, it would start much better if the starter turned faster. I have had this tractor for about 20 years, and it is a workhorse! I would greatly appreciate ANY help!!!! I’m thinking of buying a neighbour’s FE35 with a 23C engine. It’s always been hard to start and has had a lot of Aerostart sprayed into it. So before buying, I’d like to do a compression test on it to check the general condition of the engine. I have a 350 PS I compression guage. Does anyone have any clever ideas on how to attach a comp gauge to the injector ports of a 23C? Is there any one that kows about a modern 12V glowplug that fit in cylinderheadon this 232c engine? On my MF 35 glowplugs are conected in serie, tend to burne one after one. my late father purchased a fe35 new in 1958,last one the united milk co in tasmania sold, that i now wish to restore,he always prided himself on never using aerostart ,which was way to volotile ,buggers the rings and the valves he said,it started on the key up until recently,now its simply a case of towing until it approachs about 30mph,goes every time! !seriously the only time it failed was due to low cranking speed ,batteries etc,our mechanic neighbour said it was the only fergy he knew of that would still start on the key,lot to be said for daily use though. We had a four cylinder that never failed to start any weather I now have another that will not start but I ve noticed the bad one does not crank as fast as good one and its a big difference . That’s my next experiment !!! I had a similar problem and changed a few things and went very well all of a sudden it started stopping again, now i had already taken out the lift pump and found it was working as i taught by operation it manually , this time i left the lift pump in the block took off the pipe at the filter and ran the starter while the diesel ran alright i got suspicious that the flow rate was low changed the lift pump and ran the starter and the diesel sprayed all over the place problem solved. The fault was in the lever hitting the cam not enough of travel. It would be worth checking the fuel lift pump while it is still attached to the block, take the lift pump pipe going to the and filter and run your starter, the rate of diesel flow should satisfy you to be able to make a judgment if there is enough of diesel going up to the filter, also when the engine stops u would be able to check where the diesel is missing at the bleeding screws along the system. Does anyone have a replacement part number or description. We are building a 1960 Ferguson TO35 Standard diesel C23. We are unsure of the condition of the one we have. Thanks for the tip about the timing chain tensioner B motor SAAB. ( 1970-1977 ) The tensioner in our tractor was worn completely out and we’re looking for a replacement. Great articles and information. Joe . Does anyone know if is is possible to wire 2 heater plugs to a MF35 four cylinder. Is it possible and would it help start is on cold mornings. The fuel taps are notorious for getting bunged. That is the most likely (almost definate) cause of the problem. You will need to remove it, clean it out and check that the filter is still in place, if not replace the unit. Hi I have a fergie 35 4 cylinder diesel have managed to get it going but when it gets hot the engine stops all of a sudden, at first i thought the diesel ran low but up on filling the tank to the top and rebleeding the diesel lines I managed to get it going again with a bit of diffuclty, I was trying to do a little work again for about 15mins then it stopped again and again won’t start? Frustrating, so far I’ve changed the oil in both the transmission and the engine new filters and renewed teh wires to the glowplugs, any advice, i have read the forums here and seems that the enjectors come up alot about having them serviced, would this cause engine stop once warm? If you have trouble finding a timing chain tensioner to your 23C,you can find a SAAB dealer and ask for a tensioner for the 99 model with the B-motor, that is from the 70 to 77 years model. It is the same, since this motor is modelled on a Thriumph motor. Many regards from Sweden! I have had an FE35 grey and gold for 2 years and whilst at first it started moderately well most of the time – but always with heat plus a squirt from the original (now diesel filled) K gas tank – it has since become a pain in the neck. Just 3 days ago I fitted a new, non-original starter motor which clearly has a far greater turn-over speed and the tractor starts first, time everytime. Admittedly, the weather is warm but I’m keeping my fingers crossed for the cold winter months!? Oh also my old SIIA Landrover had same type of lucas HD starter. Found a later geared type (prestolite?) of starter fitted fine. This allows the motor armature to run at a higher more efficient RPM. Don’t know if the FE35 uses the same spec (ring gear mesh etc). A chap also said to me it could be a faulty timing chain tensioner (is this hydraulic?) affecting the timing on starting. He also advocated connecting a second battery mounted in the TVO position to start at 24V but my electrical theory says BEWARE. Hi i have a 23C FE35. Starts very badly and I’ll try these ideas. I made a simple rudimentary injector pop tester. Welding up a frame and handle to pump oil using a tired unit Bryce pumper off an old lister genny, some sort of (MIG gas?) gauge, an old brake fluid reservoir and a small paper in-line filter. Don’t breathe the spray mist!!!! What i do know is the aformentioned procedure should work because the pre-crank allows fuel drops to go to the manifold burner before heating. Thus the burner provides a flame during the pause phase before re-cranking. This saves wasting the battery cranking with a flameless manifold. On mine there’s another bolt i can take out of the manifold above the burner to observe the flame event if i wish. Thanks for leaving the details of your starting procedure. Maybe it will work for someone else.